Bald Head Island, North Carolina, accessible only by boat, Bald Head Island, North Carolina, existed in harmony with nature long before green was fashionable. With more than 1,100 homes in five distinct environments, this extraordinary island has attracted nearly 300 full-time residents. Built with a keen eye toward land management and coastal architecture, Bald Head Island boasts some of the most valuable real estate on the North Carolina coast and equally enviable natural surroundings. In fact, 10,000 of the Island's 13,000 acres are designated nature preserves, so you can boat, hike, swim, bird-watch, exercise and wind down amid nature's splendor. "Rumored once to have been a haven for Blackbeard and his gang of pirates, the island remains a restful retreat for visitors, vacationers and residents who are ready for a break from the hustle and bustle of everyday life. ..."
Cars are prohibited on Bald Head Island, so residents and visitors use golf carts, bikes or their own two feet to go to dinner, the beach and retail stores or to visit "Old Baldy," the Island's famous lighthouse - or simply to explore the island. Islanders enjoy luxurious amenities and modern conveniences. 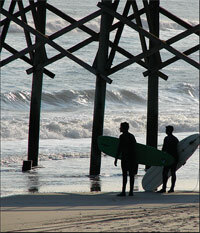 Bald Head is home to an 18-hole seaside golf course, a 10-acre marina and upscale shops and dining. There are several boutiques, a fully stocked market, deli, hardware and wine store and much more - and some of the best boating and fishing in the country. Bald Head Island is fun for the whole family, with events such as an annual fishing rodeo, a Fourth of July festival, Pirates Weekend and Oktoberfest. The BHI Conservancy can arrange excursions such as nightly turtle walks and nature hunts. On Bald Head Island, there is always something fun to do. Located at the mouth of the Cape Fear River, Bald Head Island is home to pristine waters, sea turtles, forests, fish, birds, wildlife, Spanish moss, tall oak trees and everything necessary for a truly restful getaway. Rumored once to have been a haven for Blackbeard and his gang of pirates, the Island remains a restful retreat for visitors, vacationers and residents who are ready for a break from the hustle and bustle of everyday life.